Russian Foreign Minister Sergey Lavrov said that Moscow is ready to renew its strategic partnership with NATO and has been receiving appropriate signals from the Alliance. Lavrov told a media conference on Thursday that Russia will welcome a revived partnership:“I want to say with all honesty: we are receiving signals from our NATO partners that it wouldn't hurt to renew cooperation between our military departments. If there are any specific proposals to that end, we will certainly react in a constructive way,”he assured. 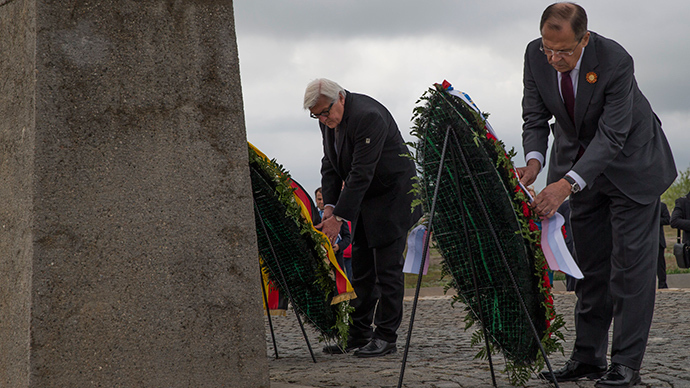 Lavrov was speaking to the media with his German counterpart Frank-Walter Steinmeier after the two had paid their respects to the memorial mass graves of Russian and German soldiers in Russia’s Volgograd. Formerly known as Stalingrad, the city was the scene of the bloodiest battle in World War II and possibly in the history of warfare. Lavrov again stressed the need for all sides to adhere to the Minsk agreements struck between the leaders of Russia, Germany, France and Ukraine in February. He said Kiev was not too eager to do it, though: "Looking at the Minsk agreements and what they say the Ukrainian authorities have to do, it doesn’t take much effort to see that the Ukrainian government, unfortunately, is stalling a lot of processes.” This includes an amnesty for prisoners of war and the lifting of an “inhumane” economic blockade from eastern Ukraine, Lavrov said.